A dozen items of news, reflection, comments, quotes and resources including BDS (on Water and on Architects), using International Law, American student battlegrounds, how the Christians are dividing, and two upbeat views on how Hebrew Israelis might divide. Israel’s warring Members of parliament, the Knesset, have all got together to produce yet another piece of discriminatory legislation, to establish a national holiday to recognize and celebrate immigration to Israel. 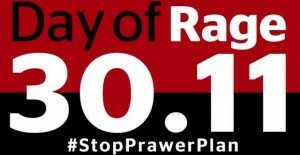 Or rather, to celebrate Jewish immigration to Israel, summed up in the title “Aliyah Day”, that yet again promotes the 80% Jewish population and slaps the remaining 20% in the face. A time to remember the horrors, and the thousands still mourning the dead and coping with the injuries and loss of homes, infrastructure and utilities. It’s been nearly three years since Newsletter 4 (too much work, too little time) but lots of people are still reading the old ones, and it’s nearly the most visited page. So we’re bringing it back again, as an occasional round-up of stories, insights and news big and small. 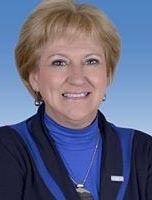 Argentine Congresswoman Dr Maria Elena Chieno has introduced a Bill that will ban Argentine government agencies from accepting participation of Israeli companies rooted in the the Occupied Territories in tendering and public bidding as well as direct purchases of products and services from Israeli-based companies operating from the Palestinian occupied territories. Chieno says that maintaining the current economic relations with Israel will be “de facto legitimising” and normalising Israeli illegal occupation of Palestine, burying even more the possibility of negotiations for a just and long lasting peace in the area. Chieno’s Bill aims to help dismantle Israel’s colonial and apartheid policies. So far, so promising. But there’s more to the story than that. This comes barely two years after a new free trade agreement between Israel and Argentina. This agreement completed the free trade deal Israel had earlier signed with the Mercosur bloc, consisting of Brazil, Uruguay, and Paraguay. Until the separate agreement with Argentina, Israel still faced restrictions on its trade with the bloc. Since the deal, Israeli companies can reach some 250 million people, with a combined gross national product of $2.8 trillion, and full access to Brazil, which currently has one of the ten strongest economies of any nation and is a major new player in global diplomacy. In 2010, Israeli companies did $1.8 billion of business with Mercosur countries, but only about $130 million with Argentina, because of high tariffs on Israeli goods there. The 2011 free trade agreement giving Israel free access to Argentina was expected to boost trade with the rest of the bloc as well, giving Israeli companies a unique opportunity to reach markets in Latin America. The Mercosur bloc is the fifth largest market in the world and many countries have tried to negotiate deals with it, but have so far failed. As the only country outside of Latin America to have such an agreement with the Mercosur countries, this also gives Israel a prominent relationship which spreads into social, political, diplomatic and cultural contact and goes way beyond just doing business. Could all this be undermined by Maria Elena Chieno’s Bill? Though it is limited to companies “based in the OPTs”, will we see a replay of Israel’s desperate attempts to get around the EC Guidelines prohibiting grants and financial collaboration with companies associated and intermeshed with the West Bank’s plundered resources? Ilana Hammerman is the journalist who illegally takes Palestinian youngsters on trips to the sea and then writes about how she broke the law. She took flowers to the hospital where the hunger striking Palestinian prisoner Khader Adnan was held. 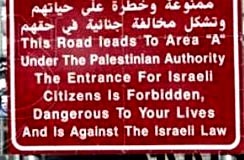 In her trips into forbidden territory she got quite accustomed to ignoring the sort of road signs the Israeli military occupation thinks are normal, which in three languages (including bad English) tell drivers entering the Palestinian enclaves that they are in mortal danger. Now she carries a stock of alternative signs to tie on and cover up the scaremongering ones. The denials of of the very existence of “one state” are getting more strident. Recently UK Foreign Secretary William Hague said that “There is no Plan B”. And on 7 Nov, US Secretary of State John Kerry got his chance to make an equally flat dismissal when interviewed on both Israel’s Channel 2 and the PA-controlled Palestine Broadcasting Corp.
Kerry’s reply was entirely predictable. What was fresh and new, however, was that he had to address the taboo subject at all, and to an audience encompassing the whole of historic Palestine. Until now, for him to be asked such a question at all, let alone on such a platform, would have been unthinkable. People such as Kerry and Hague have no concept of anything being achieved other than by state officials, diplomats and representatives of ruling elites, and they rightly assume that anything they get agreement to will have to be imposed, or at least “sold”. When asked about a One State solution they assume it’s also something that happens to people “against their will”. But In fact the most natural and obvious way for such a change in direction to happen is if it comes to be seen as beneficial and positive by a critical mass of the people. Much anecdotal evidence and opinion polls point to the savage levels of racism in Israel. But for every action there is a reaction: a very substantial minority of Jewish Israelis are appalled by the rightward drift of the country, and in despair over the failure of the two state project, which they had thought would bring closure. Polls also show that almost a third of Jewish Israelis either favour a single democratic state or are open-minded. And that is before anyone has started organising for it and before it comes to be seen as the ONLY alternative to eternal instability, conflict, trouble, violence, extreme religiosity and international isolation and loss of legitimacy. Just before the tide turns is not the best time to judge the possibilities. But everything points to the very real potential that a mass movement for unification CAN happen from below, through political organisation and action backed by international pressure. The fact that one unified movement is working together across the borders with one aim and one programme could be a very persuasive example in itself, prefiguring a future society. From that point on, the only current argument against it (that “nobody wants it”) will give way to questions of how best to manage the transition, and we’ll hear less about the non-existence of something that several million people are very curious about, or will be actively working to create. What if the Settlers were sent back to “Israel Proper”? Clearly in a territorial agreement the settlements are the NUMBER ONE obstacle, too powerful to be evicted, too dangerous to leave in place, too integrated to be unscrambled to create a contiguous map. But what if something really drastic happened to create an opportunity for withdrawal of at least the most intrusive and outlying settlements? Israel’s establishment has always left its options open by declaring some of them to be illegal, intending to keep them as pawns to be sacrificed for a bigger prize. In the two state dreamworld, the Occupation then ends, and around a quarter of Palestinians will have “a state of their own”. But what of the others? Provision of sorts might be made for the exiles or “refugees” in their camps and ghettoes in Syria, Jordan and Lebanon. Maybe the siege of Gaza might be lifted. But what is certain is that 1.6 million Palestinians will be left as a 20% minority in Israel, hated, persecuted and discriminated against. 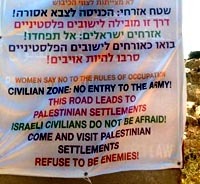 And the settlers who might be evacuated from the West Bank are already planning their revenge on them. In Max Blumenthall’s powerful new book Goliath, we can follow in detail the processes of Judaisation within Israel, which range from demographers, planners, theorists and policy-maker through to thugs in the streets, all backed up by court rulings and new legislation. He writes “While the process of gentrificiation kept tensions at a constantly elevated state in Jaffa, a reverse migration of fundamentalist settlers to Israel’s coastal heart threatened to set the [Jaffa] neighbourhood of Ajami alight. In 2010 the Israeli Supreme Court authorised a group of religious nationalist Jewish settlers from the West Bank to build a Jews-only settlement in the heart of Ajami, on a plot of land originally promised to the local Arab population to help ameliorate its housing crisis. The new settlement was a central cog in the radical right’s “building in the hearts” campaign, which aimed to create a bloc of settlements in the centre of mixed Arab-Jewish cities that would be impossible to dislodge, and to use them as citadels for the incitement of ethnic conflict.” One leading rabbi said that if [West Bank] “settlers would send one tenth of their residents to large cities” they could “create a different reality”. And the segregated city of Hebron, with its heart and soul destroyed from the inside out by a tiny, hostile, aggressive Jewish fundamentalist colony in its centre, is the model for this “different reality”. Nor was this purely a residential matter. There have been violent, swaggering marches through Arab towns, mosques and cemeteries have been daubed with slogans, and there have been cases of serious assaults on individuals recalling American Deep South lynchings. These happenings could be magnified hugely by any re-partition agreement, with evicted settlers raising hell for Palestinians back in “Israel proper”. In an illuminating talk recently , (and new book to come) Ali Abunimah looks at the South African experience where it seemed there would never be a hope of change from the inside, from the whites themselves. There are of course many differences (not least the need of Apartheid South Africa to exploit black labour as against the Zionist strategy of driving out the Palestinian population), but the similarities in attitudes before the turn away from apartheid are striking, and show how people who were 100% against a democratic idea came to agree to put it into practice in the space of just half a decade. 1994 saw South Africa’s first election on a one-person-one-vote franchise. Until almost the last moment, the vast majority of the whites (who were just 10% of the population) including Apartheid’s liberal critics, overwhelmingly rejected the African National Congress’s policy of one-person-one-vote, predicting that any attempts to impose it would lead to a bloodbath and endless civil war. As late as 1989, FW de Clerk (the conservative white leader who ended up negotiating with ANC leader Nelson Mandela) described the ANC’s demand as “totally unacceptable”. In 1990 only 2.2% of whites were willing to accept such a universal franchise. The attitudes documented were widespread dread of physical violence, of total collapse, expulsion and flight. Four out of five whites thought majority rule would threaten their physical survival. The papers were full of stories of atrocities elsewhere in the continent suggesting that Africans were inherently savage and violent and could not manage a modern country. The rest of the world, with its anti-apartheid sanctions, was depicted as naïve. Even when a majority understood that apartheid had to go, only a small minority supported majority rule and one-person-one-vote. Yes, they agreed, something has to change, but whites must retain a veto, there will be ethnic voting blocs, a federal system where no group will dominate. The white middle class and intelligentsia was no different. And the ANC was advised by its friends and patrons (e.g. the Soviet Union) to abandon one-person-one-vote, to be pragmatic, realistic and moderate. In the period leading up to the first democratic election, there was no move to the left, on the contrary there was a significant and seemingly powerful outcrop of extreme right, racist and openly fascist groups and militias, all citing their god-given exceptionalism and the Boers’ history of suffering and persecution. 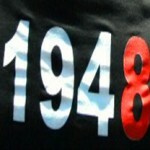 Nor was the internal economy and the security and equanimity of the regime at any time threatened. But what South Africa did face was a complete loss of legitimacy. And this is exactly why Israel is so rattled by what it calls de-legitimisation, which it privately knows will grow and grow as the two state solution collapses. Abunimah says: “I would argue that that shift is already under way”. The above is roughly transcribed from the video of Ali Abunimah’s talk. The whole Zionist rationale is that the “nation” was returning home after forced exile and dispersion by the Roman Empire some 2000 years ago. It makes a great story. It’s in their founding Declaration, it’s in daily use, every child learns it in school, and their entire immigration policy is based around the “Law of Return”, giving every Jew in the world an automatic right to”return” and claim citizenship of Israel. Even if true and they really were returning, it doesn’t begin to justify taking someone else’s country by force and, after rather a long absence, turning nearly a million people into refugees and then legislating to make their exile permanent. But now, what the Jewish Chronicle described as “a coach and horses” has been driven through the story. The BBC, after long delays due to the usual pressure for “balance” (i.e. pro-Israel bias), finally showed Ilan Ziv’s film “Searching for Exile”, with a health warning or disclaimer that it was “controversial”. 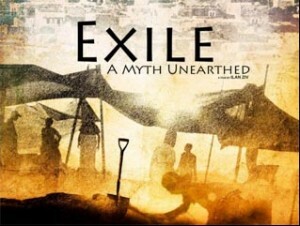 The film uses archaeology and scholarship (and some awful CGI reconstructions) to debunk the story that some 17 centuries before nation states were created, all the Jews were a nation that was deported from Palestine by the Romans after their defeated rebellion against the Empire, deprived of their “homeland” and “dispersed”. It may seem like ancient history (indeed, it IS ancient history) but the Zionist narrative that the Jews were a nation “forcibly exiled” en masse and now are “returning” to their homeland is a cornerstone of Israel’s legitimacy and the engine of all its actions. Unfortunately those who believe it and think it justifies the 1948 Nakba, the racism, the wars and all the sad and mad events since are happy to buy that narrative regardless of facts. However, it’s good to see the narrative challenged, even if it won’t begin to dent Israel’s sense of entitlement and its “Law of Return”. The film shows that the migrations of Jews (and many others) around the Roman empire, and especially from its provincial edges to the huge, glittering centres at Rome and Alexandria,were a gradual trend over centuries, more a career move than an exile; the Jewish rebellions against Rome were mostly limited to Jerusalem and the South, and the film concludes that there is no evidence of wholesale deportation, though Rome always liked to parade some captured slaves after a military campaign. We also saw strong evidence from the Jewish town of Sepphoris in the north of Palestine, which was still prospering hundreds of years after the supposed dispersion of all Jews into exile. The really neat story was when the film followed up Sepphoris into the next two millennia, as it adopted Islam while respectfully tending the Jewish heritage and ancestors still to be found in the old cemetery. 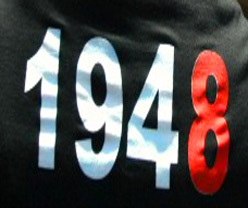 Until… Yes, until 1948 when all its 5000 inhabitants (some no doubt descended from the original Jews who had never been exiled) were turfed out by the “returning” Jews. So the “Jewish exile” story has always been propaganda — initially for the Roman emperor who wanted to make his victory over the rebels look bigger and more significant, later for the early Christians’ fable that it was divine punishment, and today for Israel’s Myth of Return. And the film clearly states (health warning!) that the only proven exile and dispersion was that of the Palestinians in 1948: “There are missing pieces in the story of this village of both Jewish and Arab history but the only clear evidence of actual exile is that of the 5,000 Palestinians in 1948.” That really said it all, and in doing so also elevated the Palestinians from mere refugees (who might be expected to settle somewhere else) to exiles who need and deserve to come back home. Touching also on the future, in the last interviews the film holds up the cultural breadth and tolerance of pre-Zionist Palestine as a model, hinting at a way to correct not only the historical facts of Israel’s ideological underpinning, but the racist practice that has been based on that foundation. For any solution, there has to have been a problem to solve. It is generally implied that the “two state solution” will solve “the conflict” by some sort of restitution for the fact that Israel has replaced Palestine on its lands and displaced all but a few Palestinians from their homes, property, society, human and civil rights and livelihood. But increasingly, in a frantic effort to convince hardline Zionism that this “two state solution” is what it must agree to do for the sake of its own self-interest, the “problem” is being openly spoken of in quite a different way. The problem is now understood in the high places not as an issue of justice and restitution, but of separation. It’s all about demography, of hiving off enough Palestinians into a separate entity where they can exercise the democratic vote without affecting the Jewish monopoly of power. This is repeated over and over again: if Jewish Israel wants to be seen as democratic without losing absolute ethnic control (defined as a guaranteed 80% majority), it has to give up some geographic space in which the Palestinians can vote separately. Manipulating borders used to be known as gerrymandering. Manipulating populations by transfer and clearance to achieve this result is known as ethnic cleansing. The one thing it isn’t about is peace. 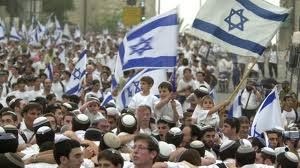 One sign of demoralisation among Israeli Jews shows up in the extraordinary number who emigrate. Between 10% and 15% of Jewish Israelis are at any time living elsewhere. Recent opinion polls find that almost half of Israeli youth would prefer to live somewhere else if they had the chance. The most often-cited reason to emigrate is because the “situation” in Israel is viewed as “not good.” So the whole demography-driven policy of oppressing the Palestinians in order to ensure a Jewish majority turns out to be self-defeating, as it leads to a trend of “reverse Zionism”: instead of “in-gathering” of Jews from around the world, Israel is exporting them. 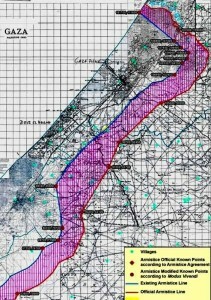 We’ve seen the maps showing the dozens of tiny fragments of land that will likely be on offer for a “Palestinian State”. But what of the rest of the space, which either by pressured agreement or by annexation, is widely expected to stay under Israel’s control? What’s in it, and what is it worth? The World Bank (not to be confused with the West Bank which denoted the west bank of the Jordan river!) has just reported that the Palestinian Authority’s economy is losing out on a potential $3.4 billion a year due to Israel’s hold on those areas. And that’s before they start drilling for oil. It says that if the PA could use the 61% of the West Bank (Area C) that Israel controls, they could expand their struggling economy by a third and slash their budget deficit in half. That is a very graphic description of an expected Two State solution from a major world institution, and one not known for its support for the downtrodden! Most of the West Bank’s natural resources and open spaces, including the Jordan Valley, are located in Area C. Yet, the World Bank report noted, less than 1 percent of Area C is open for Palestinian use. The other 99% is controlled by Israeli settlements or has been designated as nature reserves and closed military zones, all off-limits to Palestinians. If Israel ever loses its core support from American and European Jews, it could be in serious trouble. So polls of Jewish opinion are always of interest. During November, highly critical statements appeared in the British Press calling on Israel to scrap its plan for Bedouin clearances: a letter in the Times was signed by 16 very prominent British Jews (including lawyer Sir Geoffrey Bindman, film directors Mike Leigh and Peter Kosminsky, and comedian Alexei Sayle), and an ad in the Independent was signed and funded by 170. In the USA, 18,000 Jews signed a petition against the Bedouin evictions. 65 Rabbis have signed a letter pleading for Bedouin rights. And some polls in the US and Europe offer revealing insights, if not yet any wholesale collapse of Zionist support. In a survey of thousands of Jews in Europe about anti-semitism, nearly 90 percent of respondents agreed that people who did not consider Jewish citizens of their country to be their compatriots were anti-Semitic. The survey then asked whether a non-Jewish person would be considered anti-semitic “if he or she criticises Israel”. About half the respondents agreed with that. But what if the criticism of Israel was on account of the fact that in Israel itself, the non-Jews (primarily the indigenous Palestinians) are not seen as compatriots or treated as such? A Frequently asked poll question of Jews in US and Europe is, “how important is Israel for you?”. This is a common pollster’s way of demonstrating that Israel needs to exist as a Jewish state because Jews living in other countries would be upset if it changed its nature. A positive answer is assumed to validate Israel’s legitimacy. But would it really be the end of the world for them if Israel was re-booted as a fully democratic country with a large Jewish minority? Not a Jewish state but a very Jewish country.This is never asked. Now, given that these people have no intention of giving up where they are living and actually going to live in Israel, isn’t it a bit like asking a rich person with a spare property which they might visit occasionally, “how important is it for you to have a second home?” — a question that would be twice as gross if the second home’s inhabitants had been turfed out and were now homeless. So how fair is it to have not just a second home but a second “homeland”? Conversely a majority of Jews who were born into that “second homeland” are able to keep the option, in the form of a second passport, of re-locating elsewhere. Of US Jews, 31% overall are not very or not at all “emotionally attached” to Israel, and 89% say that it’s perfectly compatible with being Jewish to be strongly critical of Israel. While 69% say leading an ethical or moral life is an essential part of being Jewish, and 56% rate “working for justice and equality” as essential, only 43% think “caring about Israel” is essential to be Jewish. In other findings, 70% believe muslims face a lot of discrimination in US. A quarter of all Jews aged 18-29 believe the U.S. is too supportive of Israel. A note of caution. The hard-line Zionists do keep a tight grip over organised Jewry and will have great lobbying power even if they are ever reduced to a small minority of American Jews. And if by any chance they did lose out to Israel’s critics, there are still in America 50 million Christian Zionists waiting in the wings. So we will need those “working for justice and equality” to get out there and make their voices heard, so it’s clear that the hardline Israel supporters do not speak for all.